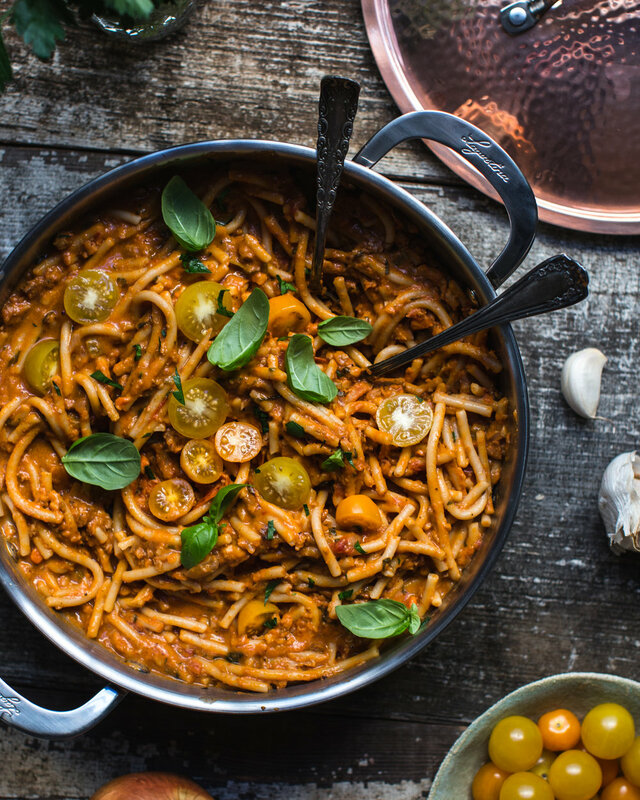 This one-pot pasta bolognese is incredibly delicious and satisfying. Bolognese is a traditional Italian meat sauce cooked with wine and some heavy cream. The results are a rich and flavorful sauce which can be served with any kind of pasta you desire. I love using thick spaghetti noodles, as featured in the picture above, but I also recommend using fettuccini or regular spaghetti for this rendition. I particularly love this recipe because I have streamlined it all into ONE pot. That’s right! You simply throw the noodles in once the sauce is loaded with tons of seasonings and spices and they cook perfectly, absorbing all of the flavors while still becoming delightfully squooshy. To start, vegan sausage is crumbled and browned with onions, carrots, and celery. Once that all gets happy- garlic, fresh herbs, and crushed fire roasted tomatoes are added to the pot. I also like adding cherry tomatoes and tomato paste for extra flavor and added texture. To make the sauce creamy, I like adding in pea milk, which is available at most grocery stores these days. Feel free to use whatever unsweetened plant-based milk you prefer. Once to a simmer, you throw in the noodles and cook. The only catch is you have to stir the mixture often so that the bottom doesn’t burn. Because the noodles are cooking in a thick sauce, movement is key. I like to use a large wooden spatula to make sure the bottom is scraped and moved thoroughly. Once the noodles are al dente, you remove from heat, add some vegan cheese, and cover with a lid. Let it sit for a good 10 minutes allowing the noodles to finish cooking and you’re done! A hefty shredding of vegan parmesan cheese on top with some fresh basil and cherry tomatoes completes this beautiful dish. Serve with a simple side salad and some crusty garlic bread for an epic meal, with wine of course! 1. In a large pot or large dutch oven, add the sausage, onions, carrots, celery and olive oil and bring to medium heat. Add a pinch of sea salt and pepper and stir with a large wooden spatula. Cook for about 6 minutes, until the vegetables are softened, stirring often. Use the spatula to break up the sausage into a crumbly texture. 2. Throw in the garlic and cook for a few minutes (2 to 3), until softened. Add the parsley, basil, thyme, oregano, and nutritional yeast. Cook for an additional 4 minutes, stirring often. Pour in the red wine and scrape the bottom of the pan. Add the canned tomatoes and continue to scrape so that there is nothing stuck to the bottom. 3. Next, add the tomato paste, cherry tomatoes, pea milk, filtered water, sea salt, black pepper, and noodles. Turn the heat to medium-high and bring to a simmer, stirring often. Once to a simmer, reduce the heat to medium and continue to cook for about 15 minutes, stirring often. Towards the 15 minute mark, test a noodle. (If using a thinner noodle, maybe check around 13 minutes as they will cook quicker). Once the noodles are al dente (cooked yet slightly hard), remove from heat, mix in the cheese, and cover with a lid. Let sit for 10 minutes to let the noodles finish cooking. 4. After 10 to 15 minutes, remove the lid and give it a stir. Season with salt and pepper to taste. If you’d like to loosen it up, add a few more splashes of milk and mix. Serve in bowls and garnish with freshly shaven vegan parmesan and basil leaves. You could also throw on some halved cherry tomatoes because it’s pretty! I highly recommend using the Hot Italian Beyond Sausage (or any of their flavors if you can’t find this one). You could use another brand of vegan sausage (or a homemade recipe), but this has the perfect texture, flavoring, and fat content for this dish in particular. You can make this a day ahead and keep in the fridge. It will thicken up considerably once chilled, so when you are ready to heat it back up, I recommend adding some more milk and baking it in the oven, covered. I would advise against heating it up on the stovetop as it could burn easily (because it is much thicker when cold). If you are heating up a small amount, you could use the stove top, just make sure to keep it moving! I personally love the Ripple brand of unsweetened pea milk for this recipe. I find that it has just the right creamy texture. The dish featured above is 4 quarts, which would be perfect if you halved the recipe. If you are going to make the full recipe, I recommend using a large pot or large dutch oven so you have plenty of wiggle room. It’s not fun to cook a sauce that’s all the way up to the brim, it can be quite stressful!